Manolo Vargas was born and raised in Sevilla, Spain at a time when flamenco was pure and a part of the popular culture. Manolo Vargas began his artistic career as a young child in Sevilla, Spain. When his teachers realized he had perfect pitch and could memorize a song after hearing it just once, the Jesuit priests at his school knew he had talent. They pulled him out of classes for leading roles in performances and plays. Manolo came to the United States and worked in clubs and theatres in Miami and Santa Fe where he worked with artists like Cacharito de Malaga, Paco Fonta, La Petrolio y La Salvadora. He toured the United States with companies like Jose Molina and Naranjito and in South America with Paco Del Puerto, La Tolea and La Estefania. Now Manolo is performing in California and giving private Flamenco lessons and workshops for guitarists, singers, and dancers. 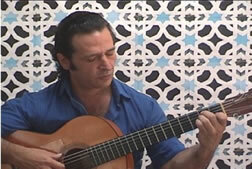 He continues to produce flamenco guitar Cd's and instructional videos.